Timeless yet trendy, the Classic Collection of bathroom vanities, storage cabinets and mirrors from Cutler Kitchen and Bath is a perfect compliment to any bathroom. These linen cabinets are a perfect solution to all your storage needs, available in 5 matching vanity colours door styles, supplied with brushed chrome handles, European soft closing hardware and adjustable shelves.. 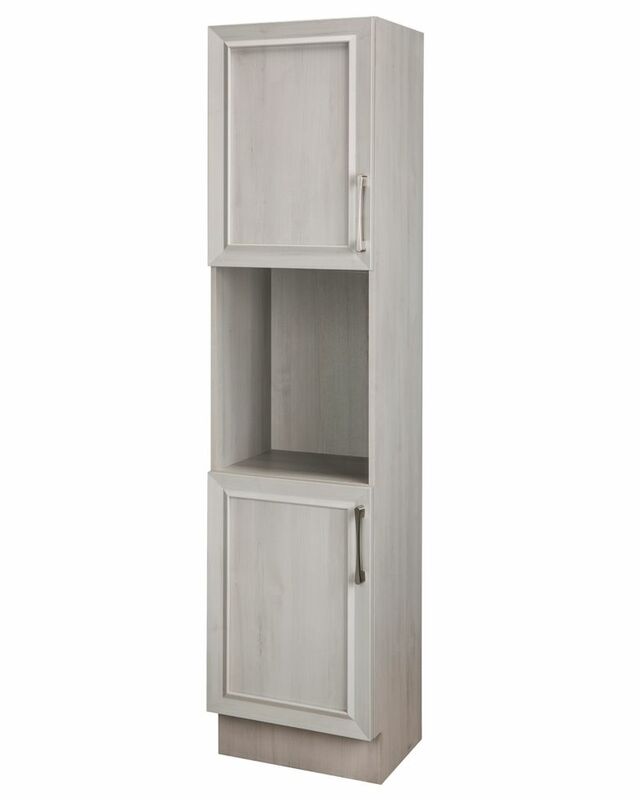 Accent your vanity with this matching linen tower. While the Hepburn Collection cannot project those qualities as fully as the iconic "Audrey" who inspired its name, we did think of her simple beauty when we set out to design this tasteful assortment of bathroom furniture. The 24 inch linen cabinet is layered with a sumptuous Dark Chocolate finish upon the solid ash wood frame. Added premium materials like a sturdy matte gold base and hardware and soft-close glides and hinges. The linen tower is a perfect match to the Hepburn vanities. The Avanity teak linen tower delivers exceptional storage in a pretty package to your bathroom. Constructed from solid teak, the graceful open-shelf design provides ample space to organize your bathroom accessories. And because teak is naturally water resistant you can be confident that this tower will remain robust in high-moisture environments. Available in natural and gray teak. The Thompson linen tower embraces the same classical aesthetic and quality craftsmanship as the Thompson Collection . More than a companion piece, it stands tall in its own right as a tasteful piece of furniture providing ample storage and stylish appeal. Available in your choice of either Charcoal Glaze or French White finish, it features 4 soft-close DWRs and beautiful Black bronze hardware. 18 Inch Meadows Cove Tranditional Linen Tower Left Hand Timeless yet trendy, the Classic Collection of bathroom vanities, storage cabinets and mirrors from Cutler Kitchen and Bath is a perfect compliment to any bathroom. These linen cabinets are a perfect solution to all your storage needs, available in 5 matching vanity colours door styles, supplied with brushed chrome handles, European soft closing hardware and adjustable shelves..